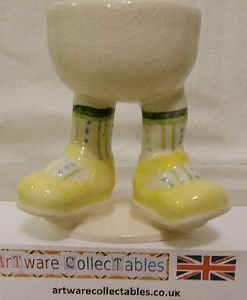 This is one of several very interesting Eggcups from Roger Michell designed when he was working in collaboration with Carlton Ware in the 'Walking Ware' series. This one is an Eggcup with yellow shoes and bluey green striped & spotted socks. It stands on a base under which is the Lustre Pottery Walking Ware backstamp and the number 26 under one foot. This Eggcup is part of a very limited edition of 100 pieces. There is evidence of crazing and there are no chips/nibbles nor restoration work.